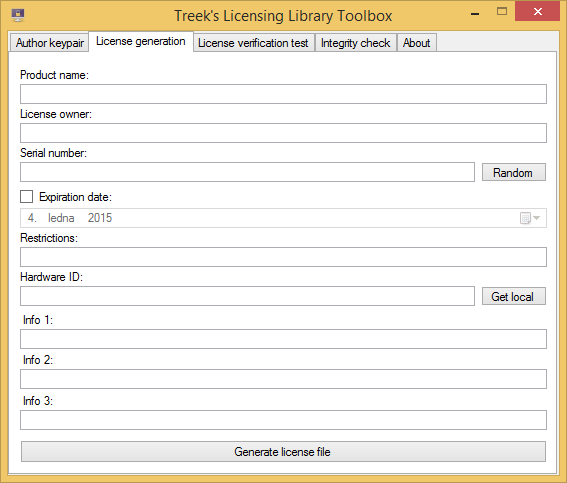 Treek’s Licensing Library toolbox is designed to create license signing keys, for license issuance and testing. It is GUI application, which makes possible to non-programmer to create license files and supply them to customers. You can work with keys on first tab of toolbox window, called “Author keypair“. If you’re going to create new keys for new application, click “Generate new” button. You’ll be prompted for path, where will be your keyfile saved. You can also load previously generated keyfile by clicking “Load keypair” button. In that case, you’ll be prompted for keyfile. When generating new keys, you can optionally encrypt your license signing key with your password and Rijndael algorithm. By clicking “Copy public key” you can get a public key XML for use in source code. First, be sure, that you’re using the right keypair (corresponding with public key in your application). Then go to “License generation” tab. Fill the product name and license owner as minimum. You may specify hardware ID and expiration date for license (optionally). When you specify hardware ID, license will be working only on computer with that hardware ID. You can add more hardware IDs by separating them by comma. 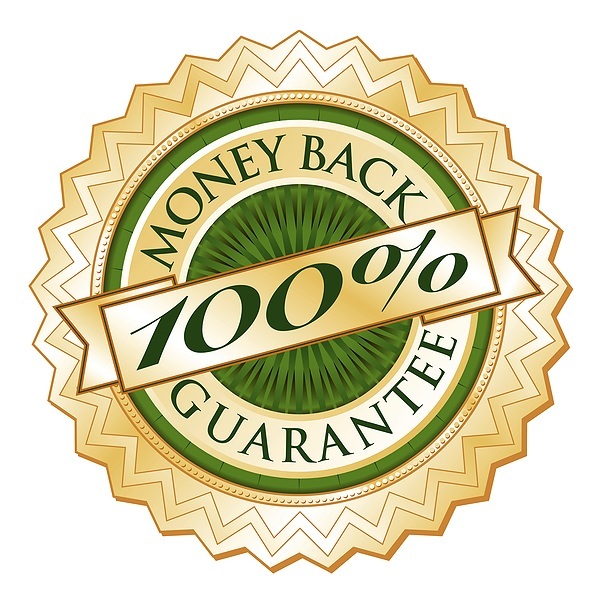 When you specify the expiration date, Treek’s Licensing Library will recognize license as invalid after this date. Manipulation with user’s computer time won’t break expiration date mechanism. Specify the path to license file. You’ll receive error details or success message. On success, you’ll get licensedetails. Toolbox does the check of TreeksLicensingLibrary.dll authenticity by computing hash of the file. This feature is there to easily find SHA1 hash of original dll file, so developer can easily implement check against dll replacement attack. 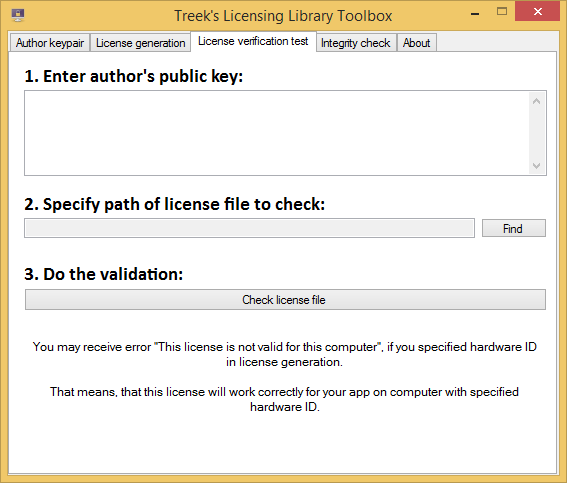 When you purchase Treek’s Licensing Library, you’ll receive your license file, which you can use to avoid demo messages in toolbox. Please note, that this will remove demo message only in toolbox. To remove demo message from your application, follow this example.